A couple of months ago, Evernote announced its partnership with Moleskine, giving birth to the Evernote Smart Notebook by Moleskine. While you’d think that the goal of a service such as Evernote would be to make paper obsolete, they actually compliment each other pretty well. One thing that surprised me is that the notebook actually made it all the way to Malaysia, a pleasant surprise indeed. If you’ve updated Evernote on iOS recently, you might have noticed a new feature called Page Camera. The idea itself is pretty simple. While it’s common for us to snap pictures of notebooks and notes doodles on scraps of paper, they’re often not cropped properly. The Page Camera makes it easy for you to select a specific area to be saved into Evernote, cropping out all the background clutter. The Page Camera feature works on all sorts of paper, but if you use it on the Evernote Smart Notebook, it takes things one step further and corrects the skew of the photo, thanks to some fancy magic with dot patterns, which means that your notes won’t look crooked once the picture is taken. 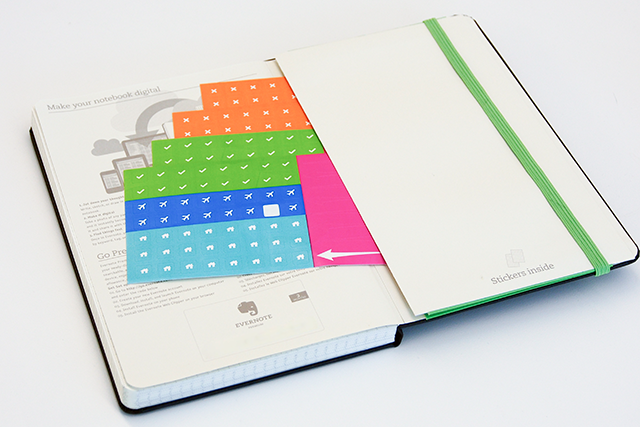 Smart Stickers are a set of stickers that come with the notebook, designed to make tagging your notes easier. Instead of having to manually add certain tags to your notes once you’ve snapped a picture, you could place one of the sticker on the page itself and Evernote will translate it to the relevant tag. The smart stickers cover the following tags: Home, Action, Rejected, Approved, Travel, and Work. The Evernote Smart Notebook is bundled with 3 months of premium service, which would save you about $15 (RM45). I noticed that the Evernote Smart Notebooks are selling for RM69 and RM92 for the pocket size and the large size models respectively. A plain Moleskine notebook costs RM52 and RM78 for the pocket size and large size respectively. So if you deduct the RM45 from the price of the Evernote Smart Notebook, it becomes RM24 and RM47. It’s still not pocket change, but it suddenly becomes cheaper than the normal Moleskine. Unless I miscalculated, that seems a pretty interesting deal, especially since you get the added features and all. If you’re looking to get started or find out how to use the Evernote Smart Notebook, you can check out the getting started guide by Evernote. I also recently shared my views on the latest version of Evernote for iOS. 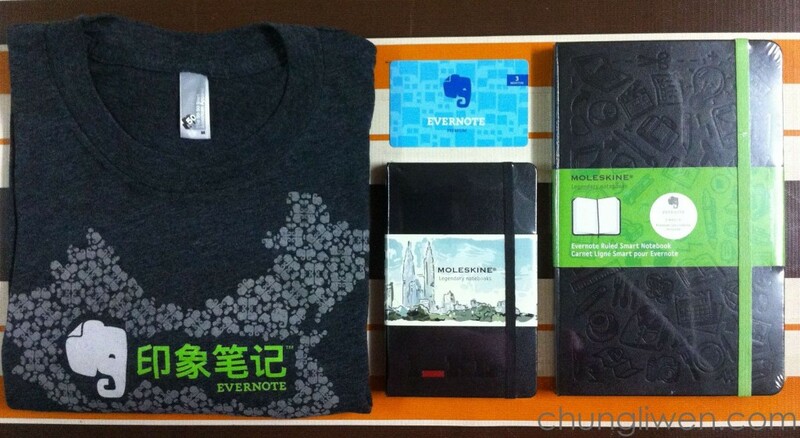 Considering the fact that I almost never win anything at lucky draws and competitions, I’m overjoyed at the moment as I managed to score a bunch of Evernote swag at the product launch today, namely 3-months Evernote premium subscription (it can stack with my current subscription, as I’m already a premium subscriber), an Evernote T-shirt (I love T-shirts! 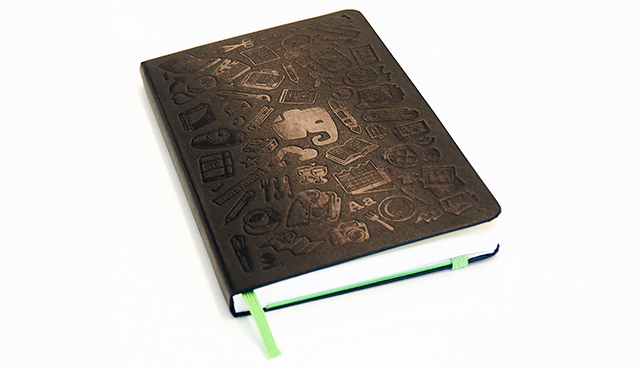 ), and the Evernote Smart Notebook by Moleskine. Woohoo! I also received the I_KL Moleskine notebook as a door gift, and those of you who know me, know that I’m a stationery junkie, so I’ve been on cloud nine for most of the night. Disclaimer: I’m not affiliated with Evernote or Czip Lee, though I am huge fans of both, and very much addicted to stationery.